It was yet another close game for the Eagles Sunday in Week 4. The Eagles did this to themselves. 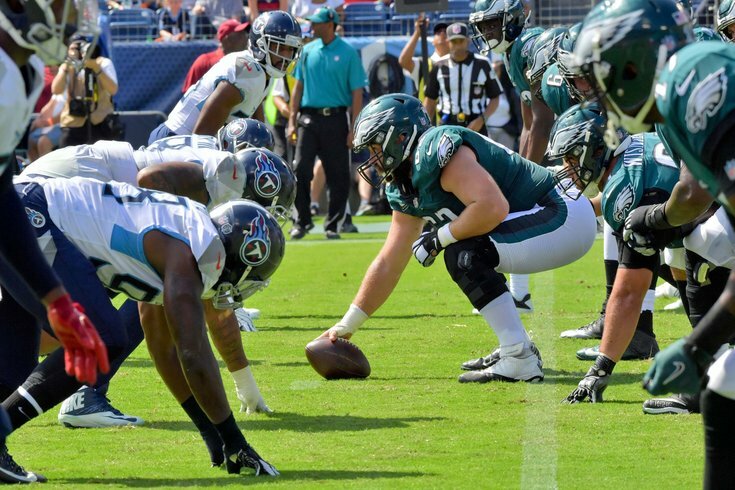 Against the Titans, penalties in key spots cost the Birds their third win of the season as they fell to 2-2 following a 26-23 setback in overtime Sunday. With the game more or less won twice following a go-ahead Jake Elliott kick, a durable defense was unable to come up with the third walk-off goalline stand of this short season. The Eagles' healthiest squad of the season (even after losing safety Rodney McLeod for the year) hit the field in Week 4 with Alshon Jeffery (8 catches for 105 yards) and Jay Ajayi (15 rushes for 70 yards) back and Wentz in his second game — looking much more polished and comfortable, eclipsing 300 yards for the ninth time in his career. A forgettable day for cornerback Jalen Mills, who was beat several times in this game, hit its low point in the third quarter when he was flagged 20 yards for a pass interference penalty, his third in the last two games, on Tennessee's first touchdown drive. The penalty bug bit on both sides of the ball, most notably in that same third quarter with the Eagles in the red zone looking to score quickly out of the locker room. Two holding calls negated two positive plays giving Philly an awkward first and goal from the 35 that Carson Wentz still turned into an incredible leaping touchdown by Jeffery (in double coverage). Jeffery's monster return was not enough to negate Philadelphia's bevy of mistakes and it's an issue that, if not resolved, could ruin the entire season. "The penalties are racking up and that can't happen," Doug Pederson said after his team was assessed eight penalties for 77 yards. "We have to eliminate that. It's something we have to look at. I'll look at it over the next couple of days and try and put my finger on it. We have to keep coaching our guys." The Eagles were able to clean it up down the stretch — for the most part — keeping flags off the field for the fourth auarter and for much of overtime. But their most costly penalty of the season came with just over three minutes left in OT, when Sidney Jones was flagged for a pass interference call on fourth down, giving the Titans new life on a play that should've ended the game. After the Titans converted yet another fourth, a Malcolm Jenkins holding call gave Tennessee first and goal with 24 seconds to play. Three plays later, a leaping touchdown with seconds remaining was probably a deserved finish for the Eagles, still trying to find their identity in 2018. Not surprisingly, Philly led the NFC in penalties and were second in the NFL heading into Week 4's tilt against the Titans. Cutting down on the missteps will surely be atop the Eagles' to-do list this week ahead of what is likely to be an even tougher match up against the Vikings back in Philadelphia in Week 5. Interestingly, penalties were not a hindrance to success last year, as the Super Bowl champs committed the 10th most penalties (116) in the NFL and seventh most yards lost of all 32 teams.